With a GDP per-capita of $4,477, Peru is a very poor country, and it is quite evident particularly as you explore the rural areas of the country. Poverty is rampant and there is much work to be done to fix the issue. Enter microfinance; as we’ve discussed here on NextBillion, microfinance gives those who are unable to access typical banking services the ability to take on loans. Since clients in that situation rarely have sufficient collateral, microfinance organizations (MFIs) have developed a unique solution; group credit. In other words, clients form groups and if one member of the group falls behind on payments, all members of the group are unable to take further loans. As a result, peer pressure as well as communal support creates the reliability necessary for MFIs to disperse funds to clients without prior credit history. MFIs have many sources of funds, one of which is Kiva.org. Kiva allows individuals to make loans to the poor all over the world. I’m a big fan of Kiva and I am currently travelling in Peru, so I decided to make some loans to micro-entrepreneurs in Cusco via Arariwa, a local MFI. Upon arrival to Cusco, I set out to visit Arariwa just to say hello and to see an MFI in action. Despite my 7 PM arrival, the team at Arariwa was delighted to see me and they promptly invited me into their office for a tour. I was incredibly impressed by the organization of the office and the team. They continually thanked me for having used Kiva to make loans to their clients while I tried to point out that really it was them who were doing all the spectacular work. Arariwa partnered with Kiva two years ago, but has been in existence much longer than that, and less than 10% of their clients are featured on Kiva. Despite that, they have a team of three people dedicated to managing the Kiva relationship and respective clients (a little known fact: in addition to providing capital, Kiva’s existence has created jobs in MFIs). Arariwa has approximately 800 lending groups (aka “Bancos communales”), each with 15-25 members. These members hold each other responsible for loans and they attend regular meetings together. At Arariwa there are several loan officers who are each responsible for managing and meeting with 10-20 lending groups, which are spread out throughout the countryside around Cusco. The job of a loan officer is not easy (they were all quite busy when I met them late at night), however they do their work with smiles and pride. As part of the deal, clients must attend periodic meetings at Arariwa where they are provided with business education and given the opportunity to discuss their financial situation and needs with other members of their lending group. Arariwa also encourages their clients to educate their children and practice proper health, including nutrition and sanitation at home. 70% of Arariwa’s clients are women, who are very likely to implement what they learn at the meetings in their households. Most of Arariwa´s clients operate small (micro) businesses, though some clients have taken loans in order to attend University (see Vittana.org). Not long after I had arrived to Arariwa, I was asked if I’d like to visit the entrepreneurs who I had made loans to via Kiva. Ecstatic at the opportunity, I agreed to visit them a few days later. 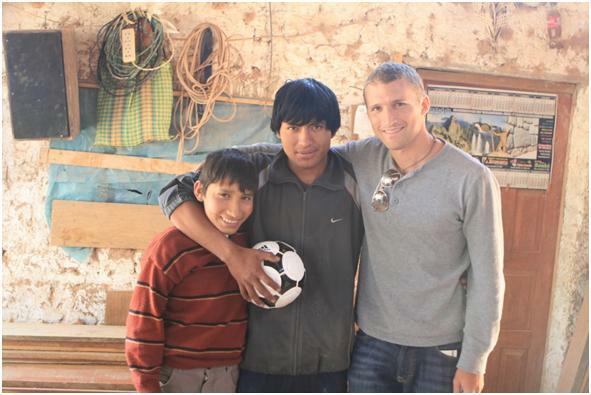 When I returned, the entire Kiva team and I jumped in a pickup truck and headed to the poorer district of Cusco where the lending group “El Amancer” is based. Ninoska, one of the Kiva team members, came along to add to her journals of the clients; she follows up with each client to ask how they have spent the money they borrowed and to verify that it was spent on the intended purpose (rather than on food, discretionary purchases or alcohol). The first client we visited was a very poor carpenter who manufactured furniture (usually tables and beds) out of his own home. His wooden house was perched precariously on the edge of a hill and had dirt floors. In order to expand his business, the carpenter had taken on a loan of 1000 Soles (approximately $360) due back in four months at a 4% interest rate. The Arariwa team estimated that he was able to complete one table every two to three days and sell it for a profit of roughly 20-25 Soles ($7-9). The carpenter was allowed to spend the loan on anything related to his business, but its likely that a portion of it went to the purchase of machinery that would help to reduce the time to completion of each piece of furniture. Unfortunately the carpenter was out delivering a finished product when we arrived, but his family let us see the woodshop. After visiting the carpenter, we visited Judith, who I had made a loan to via Kiva. Judith is an exemplary woman with an admirable level of dedication and inspirational ambition. A chef by trade, Judith has spent the last four years living in Cusco and teaching cooking classes at a local trade school. At the same time, she was working in various hotels and restaurants as a cook. 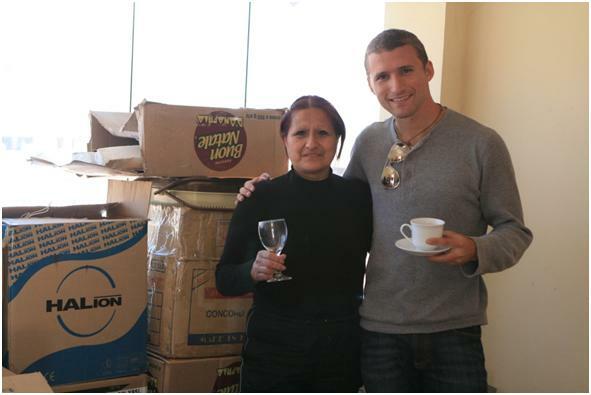 Recently, a friend of hers asked if Judith could cook for an event in Lima. After that experience, Judith decided that she could use her skills to cook for large groups. While keeping her job as a cooking instructor, Judith started making box lunches for tourists leaving on Inca trail treks. Seeing the success of that endeavor, Judith decided to approach Arariwa for a loan to purchase kitchenware for a larger scale enterprise: catering. When we visited her home, Judith proudly showed us her boxes of matching plates and cutlery, which she used to put on events such as wedding receptions. She was quick to say that none of her success would have been possible without Arariwa. As if her multi-job situation wasn’t difficult enough, Judith is also a single mother with a five year old child to care for. Still, Judith dreams big and believes that this is only the beginning. She gave me her email address and exclaimed (in Spanish), “Next time you come to Cusco, let me know so that I can give you a tour of my very big catering company.” Best of luck to you, Judith! Meeting Judith and visiting the home of the carpenter were truly inspirational experiences that highlighted the impact we can have through small micro-loans. At the same time, the visit served as a stark reminder that there is still a long way to go before poverty can be alleviated. For every Judith out there, there are still many others who either don’t have the ambition or don’t have the skills to operate a micro-business. MFIs like Arariwa are trying to help those individuals by providing business training and a support system. Did my funds go directly to these entrepreneurs? No. Last year, Kiva went through a bit of a controversy when the NY Times wrote an article about how funds are often disbursed to clients prior to the client appearing on Kiva’s website. In other words, the funds raised by Kiva were being sent to MFIs to replace funds that had already been disbursed and were in effect being lent to someone else. In my opinion, the issue was always a moot point; with limited access to capital, I believe MFIs wouldn’t distribute loans if they didn´t believe they could raise the necessary replacement funds on Kiva. My view on the matter was reconfirmed when I visited Arariwa; both the clients and the employees genuinely viewed me as the source of the capital for the loans. Despite knowing that my contribution was made well after the loan was actually disbursed, they were sincere in treating me as if I had provided those specific funds. In short, Arariwa would not have made those loans if Kiva didn’t exist. Thank you, Arariwa, for your hospitality and your dedication and thank you, Kiva, for making that connection possible.